Rental fee for the Lady Slipper Lodge shelter is $60 (including tax). This building is available for rent on Monday-Saturday from 8 a.m. to 5 p.m. and Sundays from 11 a.m. to 5 p.m. Groups must clean up and vacate the building by 5 p.m. so it is available for Naturalist programs in the evening. Please note that the parking lot is not plowed during the winter months. Reservations are accepted up to one year in advance by calling the park at 218-595-7100. There is no modern restroom facility or water available at this building. There is a vault toilet near the parking lot. The shelter building holds up to 70 people. There are no picnic tables inside, only benches. This building is suitable for meetings and weddings, but not for picnic-type events. Changes to room set-up are the responsibility of the renter. The room must be returned to its original condition by the end of your event. The shelter is not heated. It has a fireplace, but firewood is not provided. Gathering of firewood is prohibited in the park, but is available for purchase at the park office. Campfire rings are available on the grounds around the building. At the conclusion of the event, please pick up the facility area. Decorations should be removed, and trash should be bagged or placed in the barrels provided. 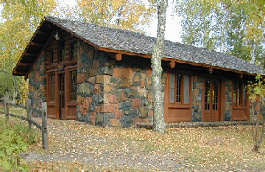 Intoxicating liquor is prohibited in all Minnesota state parks.